Solo Spectroscopy Technology. What makes it different? What makes Solo® Spectrosccopy different? Current spectroscopy solutions, whether FTIR or dispersive and gratings-based such as MEMS, rotating Czerny Turner or fixed grating with a mulltiple-element CCD, are not ideal. By their very nature they are multi component systems, with different components dispersing and detecting the light, that are complex and expensive to manufacture, often suffering from issues with misalignment and stray light. Worse still, as they are miniaturised, the spectral resolution and spectrometer performance inevitably suffers. Rather than continuing to chip away at existing approaches, Solo Spectroscopy offers a radical change to the way spectroscopy is performed. Solo Spectroscopy offers the economies of scale associated with mass manufacture. The chips have been fabricated in commercial telecoms foundries using mainstream semiconductor chip technology producing several thousand spectrometers per wafer. 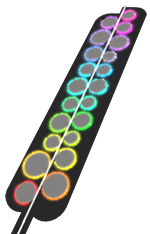 The Solo Spectroscopy semiconductor chip comprises an optical waveguide along which broadband light is evanescently channelled into a series of resonators (anything from 2 to >1000 resonators per chip) each of which is responsive to a particular wavelength. Within each resonator the specific wavelength forms a whispering gallery mode while other wavelengths continue to travel along the waveguide. The resonators are active detectors and directly absorb light to produce electron hole pairs, measured as a photocurrent. The spectral range, resolution and sensitivity can be easily controlled via choice of semiconductor and structural design. The chips may also be arrayed for high resolution with wide spectral coverage for hyperspectral imaging applications.